Grillmeister is a small game written in Python during a "3-hour game programming challenge". The goal was to create a complete game during 3 hours - idea, concept, graphics, programming. 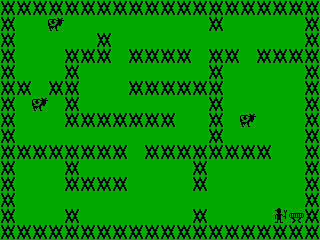 The final game consists of less than 300 lines of code. The graphics were done in a LCD-display inspired style, in order to save time in creating them, while also retaining a consistent style and graphics that are easy to recognize. The game itself is nothing special, but it might be of use if you would like to have some insight into Python programming. It uses the Pygame library for displaying graphics and handling keyboard input. Note however that the main goal in this challenge was to finish a game in 3 hours, not necessarily to write the most beautiful code. There are a few things that could (or should) be done much better or nicer, but have been done in a quick and dirty way, to be able to hit the deadline. 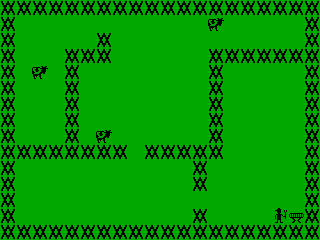 Still, it can serve as a simple example of how to program games in Python. Python is a very easy-to-learn language, and also my personal favorite. Still, it's possible to create very powerful things with it, so don't think of it as a "toy language". You are a BBQ guy who has to get steaks out of cows that are wandering around on your property. Once you got a steak, you have to place it on the grill, then go for the next steak. But you have to hurry, otherwise your steak might be too well done. If you accomplish this, the game starts over again, just with more cows. Small hint: You can also go back to the grill to look after your steaks if you don't carry a steak at the moment. If you modify the source code, you can change the layout of the map. - Do not use Windows Notepad to view the file, use a proper source code editor instead. The code was written on Linux, and the Windows Editor won't display line wraps correctly. - Download and install Python and the Pygame library in order to run the game.